Baani The Address Sector 56 Gurgaon is a premium Retail & Office Project on the Golf Course Road. Located near the Golf Course Extension Road Baani The Address provides you an opportunity to invest in retail shops of various sizes. Baani as a builder has achieved quite a good reputation in the commercial real estate market in Gurgaon. 2.5 Lac sqft of total area with ample parking space. As the name suggest "The Address" has become the main landmark as well as the address for Golf Course Road and Golf Course Extension Road. There are available Retail Shops and office spaces with variable sizes and investment. 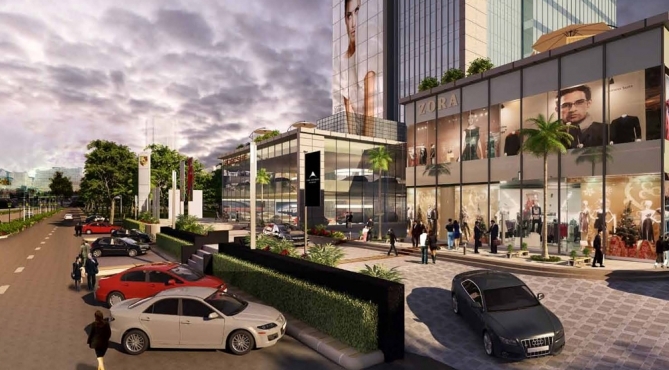 An Open High Street Retail Market on Golf Course Road, Sector - 56, Gurgaon "Shops Sizes 550 Sq. Ft. Onwards, Possession in 6 Months" Project Sourcing & Planning: Under Development Total area of 250,000 sq. ft. with over 90,000 sq ft of premium retail space at Ground & First Floor. The all project will be the first of its kind in this region. There will be ample parking and professional parking management and support services. Innovation and Style are the values that have driven BAANI Group from its inception in 1981. BAANI today is a well established and reputed real estate development company that has for long been well known for its excellence in the commercial ,residential and institutional development sectors. Managed by a dedicated team of hard working professionals,BAANI’s entrepreneurial approach, product design, strategic vision, forward thinking approach, disciplined work culture, technical expertise and on time execution of projects ,has made BAANI respected with its investors and among the well known companies in India and abroad. Our portfolio extends across the development and construction of world class office space, retail spaces, IT campuses, malls ,premium residential developments and a full array of hospitality projects.